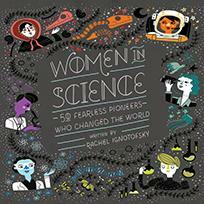 The New York Times bestseller Women in Science highlights the contributions of fifty notable women to the fields of science, technology, engineering, and mathematics (STEM) from the ancient to the modern world. The New York Times bestseller Women in Science highlights the contributions of fifty notable women to the fields of science, technology, engineering, and mathematics (STEM) from the ancient to the modern world. This fascinating collection contains information about relevant topics such as lab equipment and rates of women currently working in STEM fields. The trailblazing women profiled include well-known figures like primatologist Jane Goodall, as well as lesser-known pioneers such as Katherine Johnson, the African-American physicist and mathematician who calculated the trajectory of the 1969 Apollo 11 mission to the moon. Rachel Ignotofsky grew up in New Jersey on a healthy diet of cartoons and pudding. She graduated with honors from Tyler School of Art's graphic design program in 2011. Now she lives in beautiful Kansas City, Missouri, where she spends all day drawing and learning as much as she can.